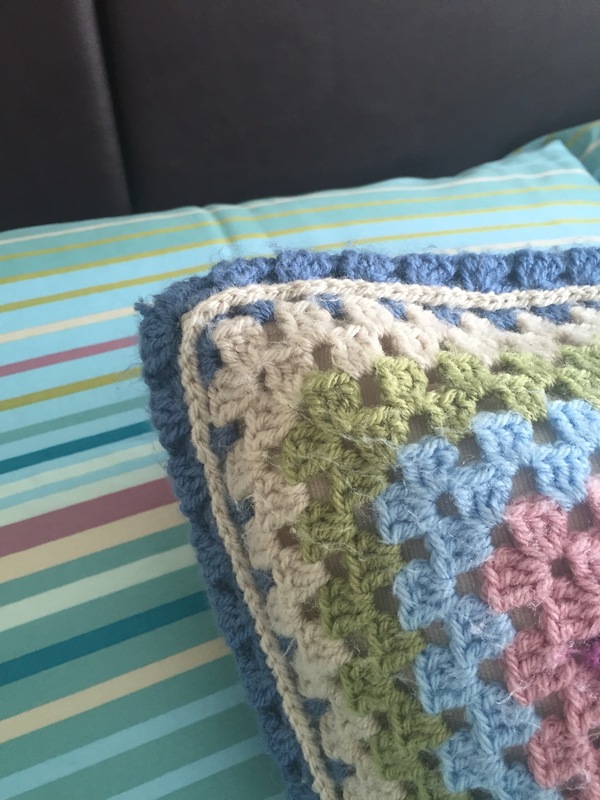 The cushions in questions are my very first two crochet projects. It’s because of them that I made the Identity Crisis Blanket because who can have cushions without a matching throw? 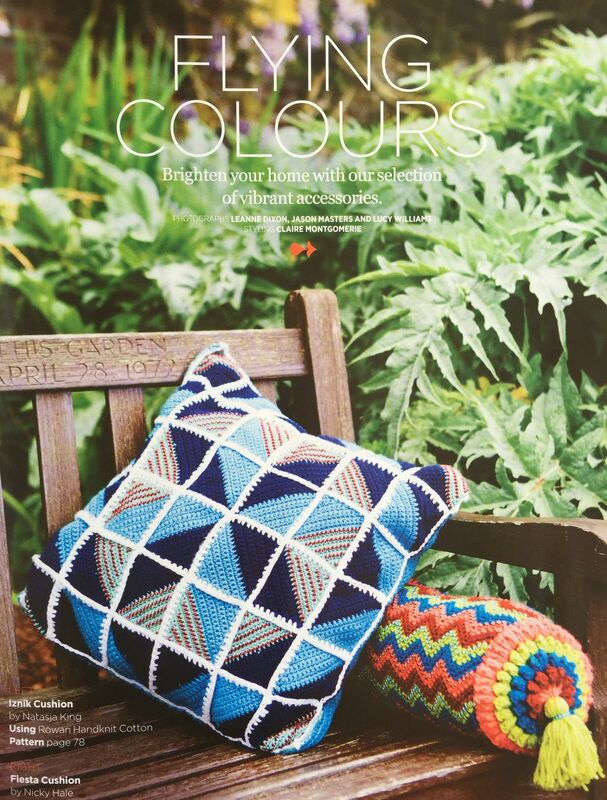 Do you see the green square in the centre of the cushion below? 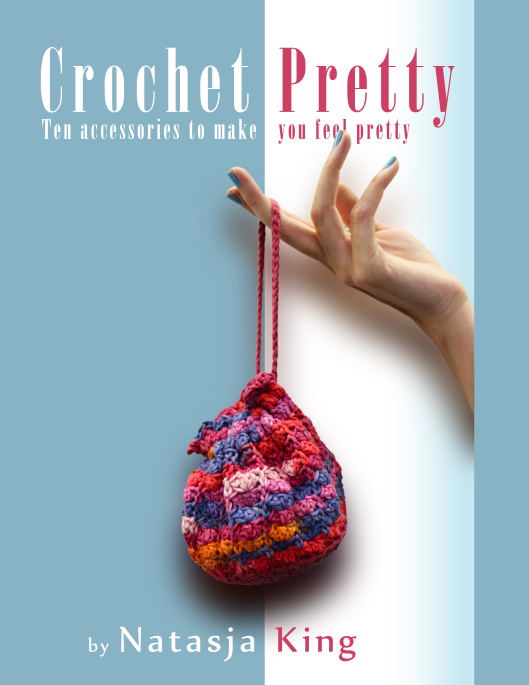 That was the very first thing I ever crocheted, back in August 2009. That square is the result of an afternoon in front of YouTube with a library book at my side and lots of swearing (from me), comforting words (from John) and cups of tea. There is no way I will ever get rid of the cushion, so when it started to look exceedingly saggy (much like its owner’s bottom) I had to fix it. 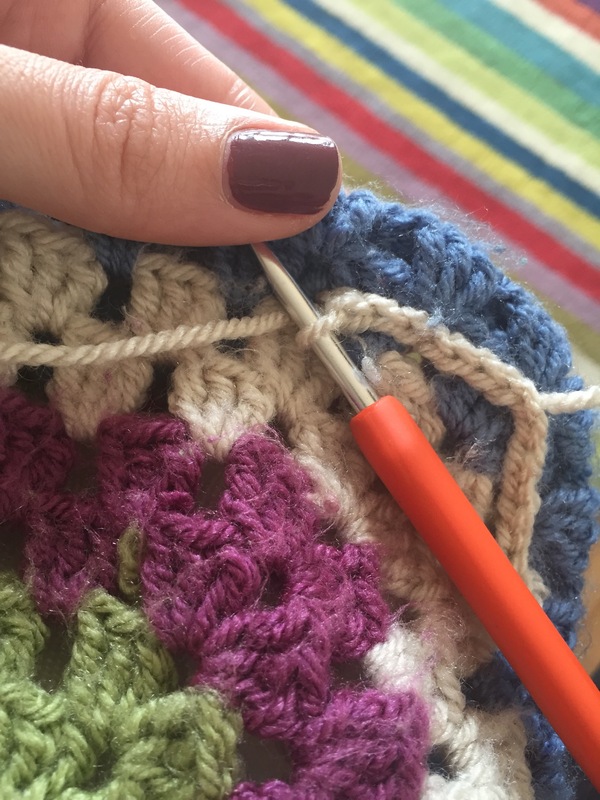 All I needed was a plan, a ball of Parchment Stylecraft Special DK and a 4 mm crochet hook. But first let me show you what I mean by a saggy cushion. Where my thumb is you can see the cushion inner if you look closely. That means there are about two rows of DC shells that don’t sit tight against the inner any more. Flabby and saggy indeed. But my rescue plan worked! No more saggy cushions! All it needed was a row of slip stitches around the posts of each DC in each shell, but going through to the corresponding DC post at the back at the same time. Between shells I worked a chain and on the corners I worked two chains. It’s super easy but also super effective. Behold saggy cushions no more – in fact they now have A Bit Of An Edge. 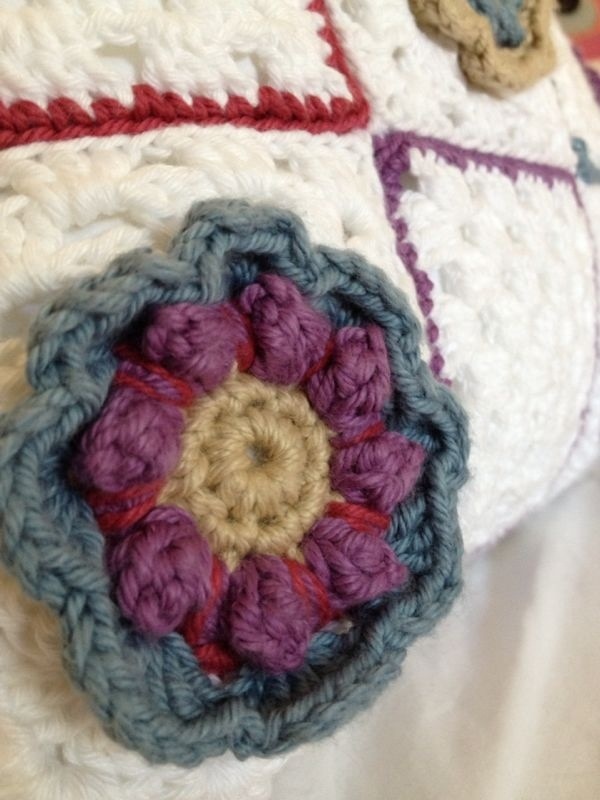 The slip stitches on the front makes for a lovely detail which I like. And in the back the stitches are almost hidden and all you see is the indentation. So there you have it! If your cushions have stretched out of shape and are in need of restoration, give this method a go. 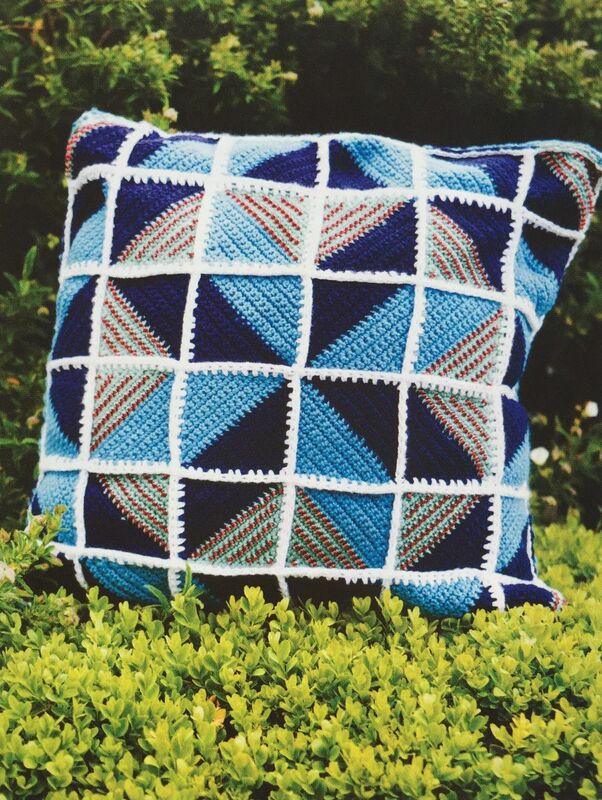 I actually think the row of slip stitches finishes off the cushion so you may want do it on purpose for your next cushion – just make your cushion two rounds bigger than it needs to be, and add a round of slip stitches around the posts of the front and back DCs! The only down side is that you can’t have a cushion opening along a side, you would have to do an envelope style opening at the back. Now if I can only sort out my saggy bottom, I’d be one happy lady. 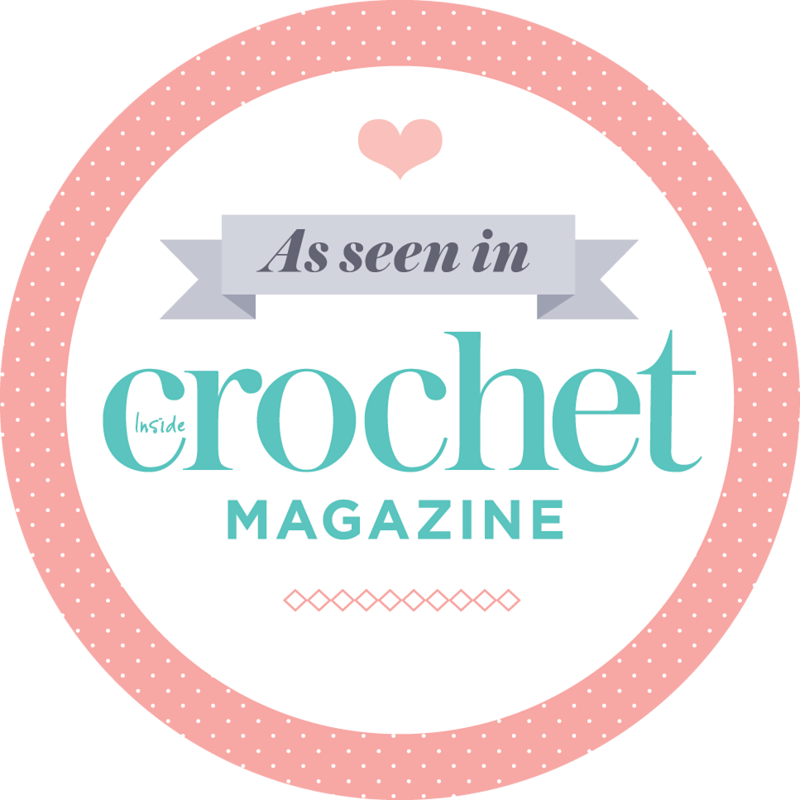 Posted by Natasja in My crochet, My ramblings, Pattern, Ta-daah! You know that square motif I’ve been telling you about that had me so excited? Well, here it is. It’s called Granny Square In Bloom. I used the squares to make a cushion for my very good friend Liezel, as a birthday present (you can see her photography blog here). She reads this blog and follows me on Instragram so I couldn’t post regular photo updates. 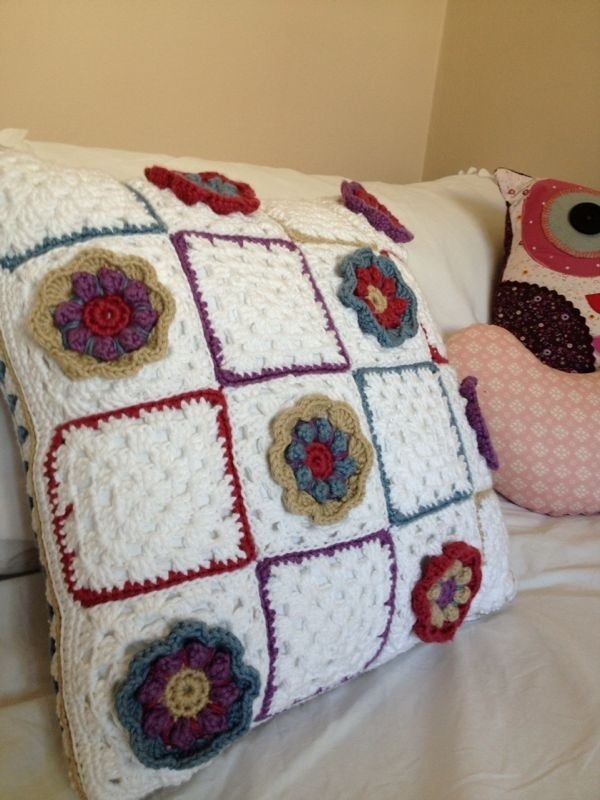 I gave her the cushion yesterday which means I can finally reveal it to my lovely blog readers. The cushion was a huge hit! I’m so glad that I could make her happy with something handmade. Liezel went home and took these photos of the cushion in it’s new home. As you can see, she has a bird theme for the cushions on her bed. I wanted to stick to her theme, so I used three Red Robbin buttons. Aren’t they cute?! Yarn: Stylecraft Cotton Classique in White, Rowan Handknit cotton in Ice Water, Raspberry, Linen and China Rose. 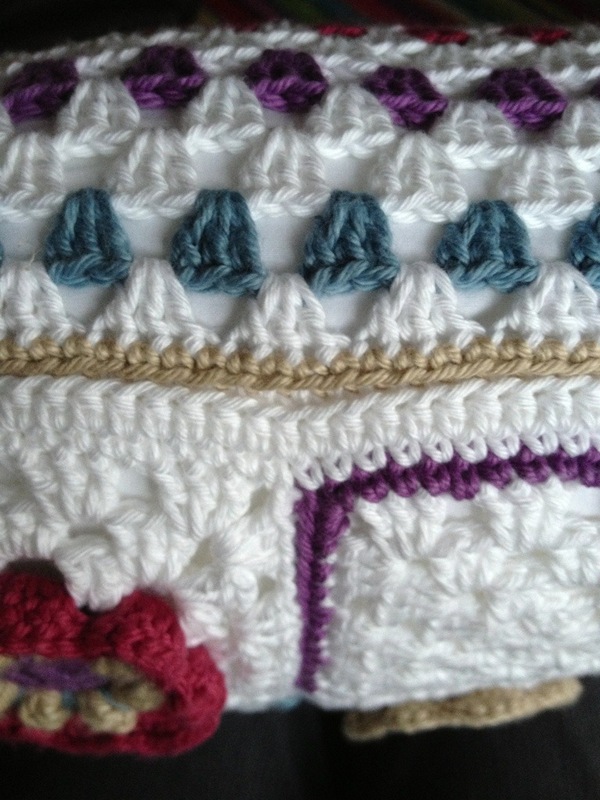 Pattern for the front: Eight traditional granny squares of 4 rounds each in white, finished off with a row of SC. (Each of the four colours were used for two squares.) Plus the eight 3-dimensional flower squares which are my own design. I call it Granny Square in Bloom squares. The pattern is available for free on the Photo Tutorials tab, in this blog post and also on Ravelry. I didn’t add a row of SC on the flower squares. Pattern for the back: Traditional granny square of 19 rounds. Each colour round is seperated with two white rounds. 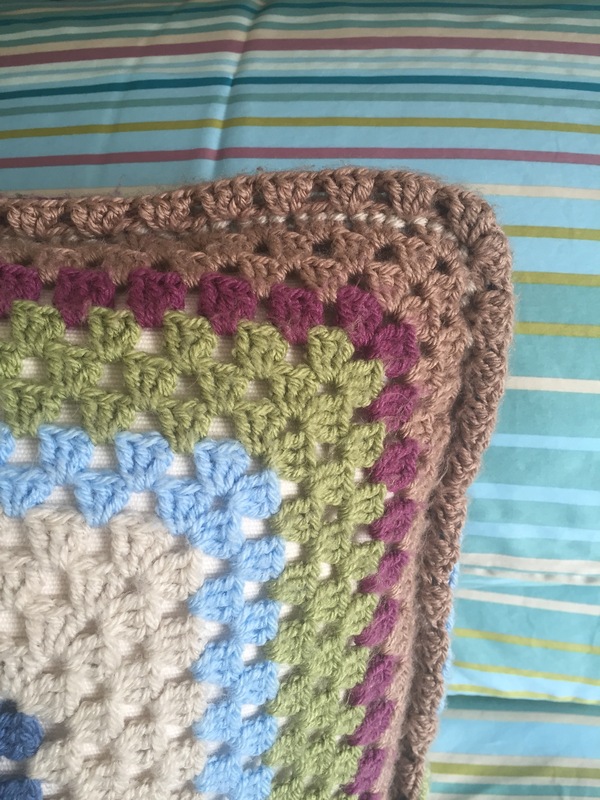 I edged the granny square with SC in Linen. 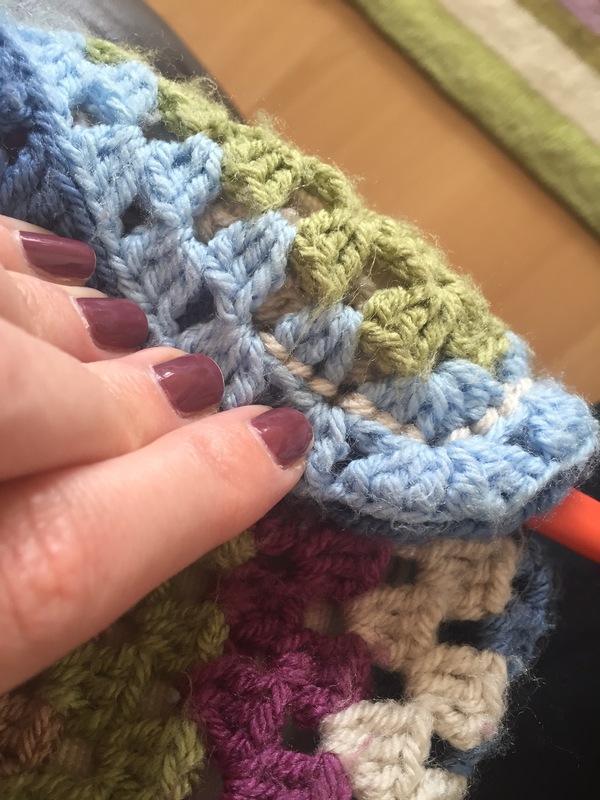 Construction: The 16 squares which together forms the front, and the three side seams were sewed together with a slip stitch seam as described here on the Simply Crochet website. 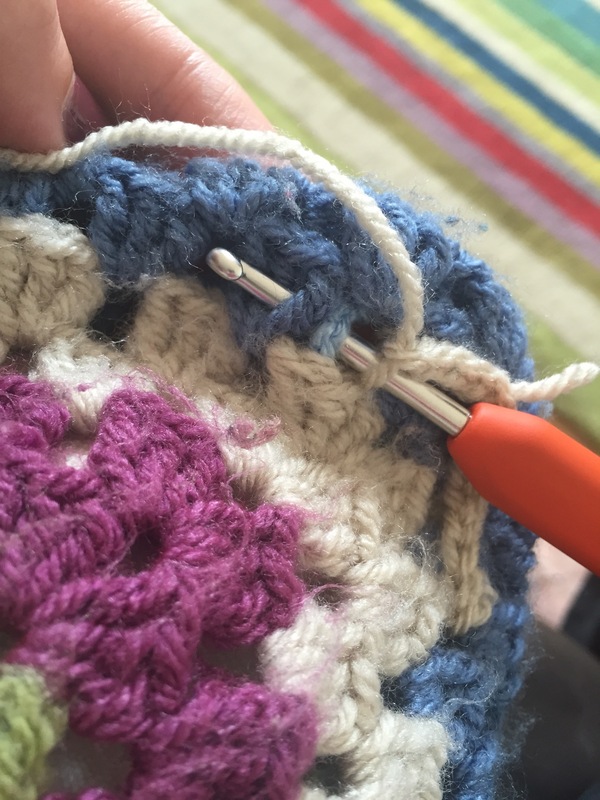 For the opening I slip stitch-joined up to the first shell on each side so that it would form neat corners. 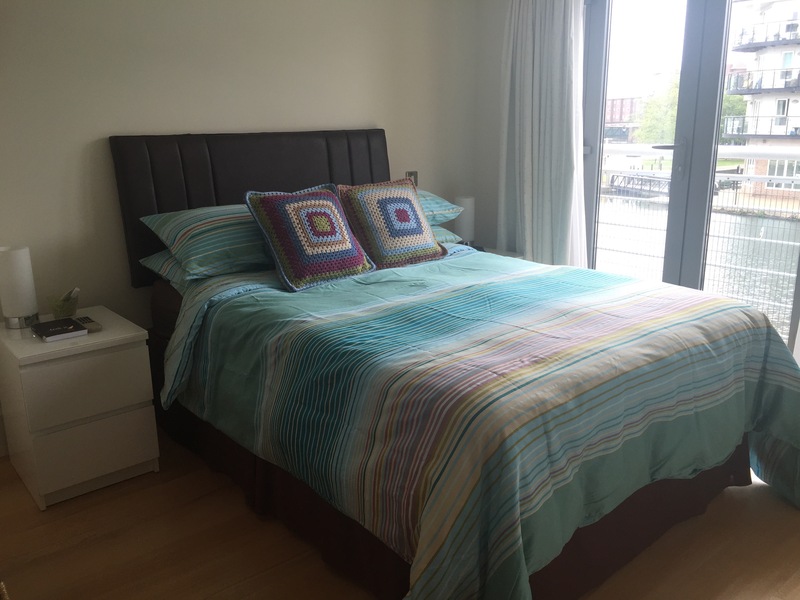 Inner: Microfibre 16″ inner bought from Design-a-Cushions. Design-a-Cushions recommend purchasing an inner one inch bigger than your cover. I therefor made sure my covers were 15″ squared. Doing it this way gives you a perfect puffy cushion. I can highly recommend Design-a-Cushions. 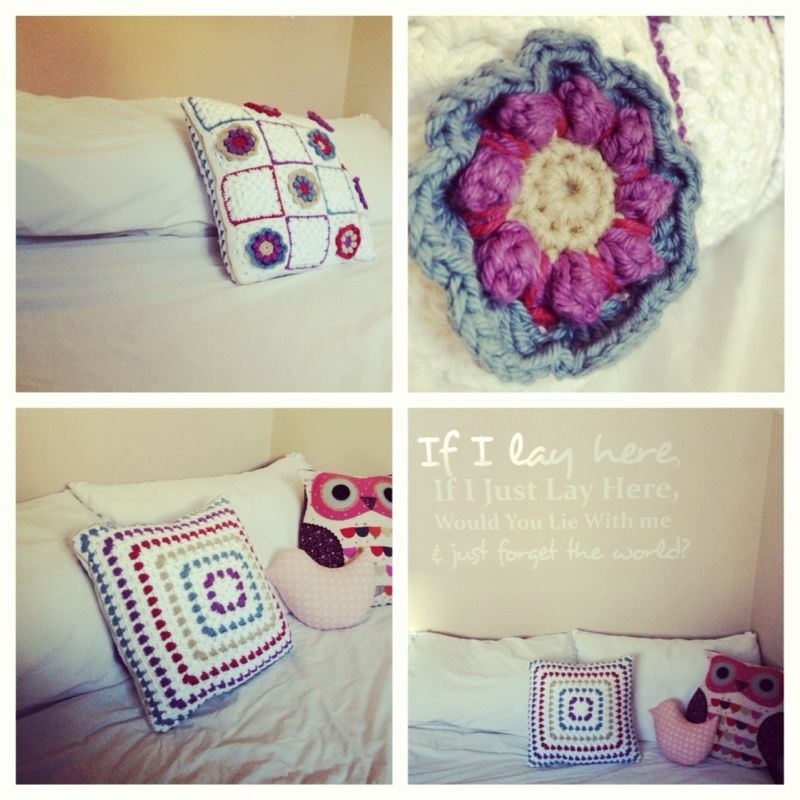 They are my favourite cushion inner supplier in the UK. 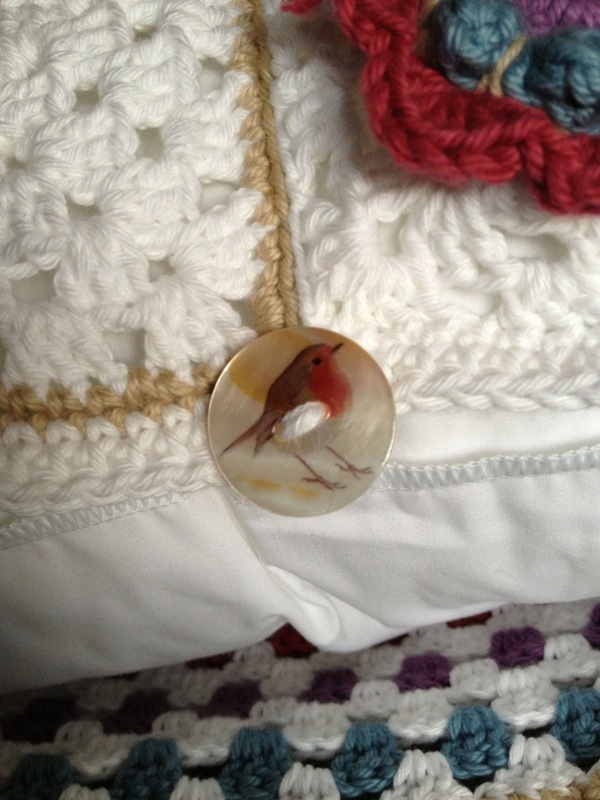 Red Robin Button: Natural Shell Zakka buttons that I bought on eBay from this seller. I thoroughly enjoyed designing the square, knowing that my friend will be the very first person to own something made in that design. Liezel, I hope you have the sweetest of dreams when you’re resting your pretty head on the cushion.